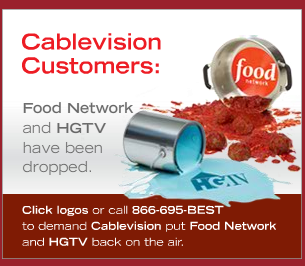 Cablevision Reports - No More Food Network!! BETHPAGE, N.Y., Jan. 1 /PRNewswire-FirstCall/ -- "Unfortunately, Scripps has decided to stop distributing HGTV and Food Network to Cablevision customers upon the expiration of our current agreement at midnight, December 31. We are sorry that Scripps' current financial difficulties are making it impossible for them to continue our relationship on terms that are reasonable for Cablevision and our customers. We wish Scripps well and have no expectation of carrying their programming again, given the dramatic changes in their approach to working with distributors to reach television viewers." Here's what The Food Network has to say about all of this.